Investigators get their first look at the destroyed main buildng of Grandview Palace Sunday afternoon, shortly after most of the remaining hotspots were doused. The heat was so intense, it melted steel, resulting in the bowed beams which supported the main entrance. LOCH SHELDRAKE  Grandview Palace resident Jason Barreto remembered what his daughter said to him as their home burst into flames Saturday night. 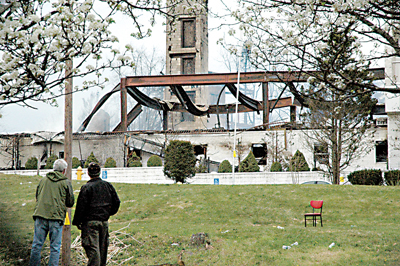 Nor will the many firefighters who fought the disastrous blaze which consumed the historic, Borscht Belt-era Brown’s Hotel  more recently known as the Grandview Palace condominiums. 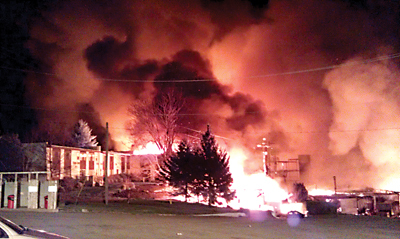 In what officials are calling possibly the largest blaze of an occupied building in Sullivan County history, five of the old hotel’s seven structures were lost, with the main building reduced to smoldering rubble by Sunday morning. Forty-five fire departments from Sullivan, Orange and Ulster counties responded to the massive blaze which  as of Sunday afternoon  was still not completely extinguished. Save for four firefighters who were injured, no one was killed or hurt in the fire at the Grandview  which in its heyday as Brown’s, hosted some of entertainment’s giants. Comedy legend Jerry Lewis once kept an apartment there, long before the 500- plus-room hotel was converted to 396 condos in 1996. Saturday’s fire, however, damaged even the distinctively rounded building once known as the Jerry Lewis Theater. Hundreds of firefighters were needed to fight this gigantic blaze at Grandview Palace near Loch Sheldrake on Saturday. The fire destroyed much of the former Brown's Hotel, which had been converted to condominiums  many of which were occupied. “It was bad,” said Hurleyville Fire Chief, Jim Kaufman. Kaufman was in command of the scene after the first call came in at 6:06 p.m. Saturday, due to the fact that the Loch Sheldrake fire chiefs were out of town at the time of the incident. Indeed, the joint effort prevented the enormous fire from spreading to any neighboring structures. “One of our top priorities  besides putting this thing out  was keeping it contained,” said Kaufman. The chief estimated that just shy of 20 acres were lost to the spot fires alone. Between 75-100 residents of the Grandview were in the complex when the fire began. Most got out when the alarms sounded, but four residents had to be rescued by fire personnel. Reported explosions were said to be propane tanks, while more than 5,000 gallons of fuel oil were secured by the firefighters. “My guys ... all of the men here on the scene did a wonderful job. These men are the best there is,” said Kaufman. About 10,000 feet of hose was used just to get water to the scene, and for a while, water pressure in and around Loch Sheldrake took a noticeable dip due to the massive effort, according to Kaufman. Later Saturday evening, Rolling V Bus Company shuttled haggard residents down the road to the Paul Gerry Fieldhouse at Sullivan County Community College for emergency shelter. The disaster relief effort was coordinated by the Red Cross. Shelter Manager Jim Dowling of Orange County said that as of Sunday afternoon, 35 people had registered for emergency shelter and services at the college’s sports complex. “We had 17 folks stay last night,” he said. The emergency shelter was set up and opened by 9:30 p.m. Saturday evening. “As soon as the county asked for our help, we started mobilizing immediately,” said Dowling of the ongoing relief efforts. “The college has also been very, very helpful in all of this,” he continued. Besides the facilities, the college has also offered food vouchers for all those in need, for use in the college’s cafeteria. The Red Cross is providing  among other aid  mental health services and medical professionals, as needed. Around 1 a.m. Sunday, for example, nurse practitioner Renee Hook could be found moving amongst Grandview’s residents, taking prescription information for patients of the doctor for whom she works, Umar Chouhdry of NV Health in Liberty. Hook said it was a way to help people  who had lost all of their prescriptions and medical information in the fire  get the medicine they needed without having to head to the hospital. “Between the college and us, I think we’ve got them pretty much covered for the time being,” said Dowling. Fellow resident Steven Locurto was on his way back from the tennis courts when he was denied entrance due to the growing fire. “My pet was in there, so I had to get back in,” he recalled, “so I ran through the main entrance, and when I reached the stairwell, it was completely smoked-out. ... I closed my eyes, and it was the same as when they were open! “... That’s when I knew it was going to be real bad,” Locurto remarked. “I’m just happy that everyone made it out safe ... my family, everyone got out,” said Barreto. The Red Cross is one of several organizations assisting the displaced. Call 1-877-REDCROSS or head to www.nyredcross.org to find out how you can help.